1. Log in to your Yola account and make sure you are on the "My Yola" page. 2. Click Domains along the top menu bar. 3. Click Advanced settings next to the domain you want to edit. 4. Click Set up name servers. 5. 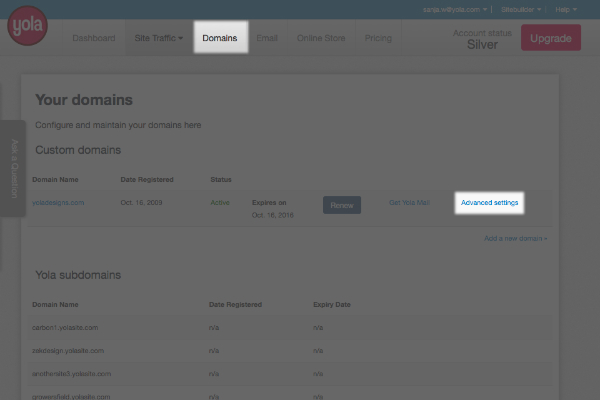 Click Change name servers for... so you can access and change the name servers for your domain. 6. Make the changes and click the Update name servers button. If you need to add more than two entries, click Additional name servers. It can take up to 48 hours for this change to fully propagate across the internet. If you have email addresses set up using the domain name, you will need to make sure the same MX records are added to your new provider when you make the change. 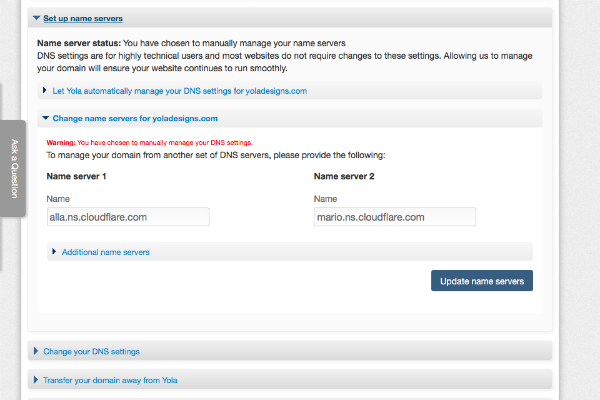 Changing the name servers will prevent your published Yola site from being accessed.